Recently, we have been looking at earth architecture in Niger and at the examples that pre-date French colonization. An enduring example of such an architecture can be found in the Southern part of the country where the Hausas live. The Hausas are one of the largest West-African ethnic groups spread across Niger, Nigeria, Cameroun and Ghana. Pre-colonization, Hausa master builders were an affluent and influential class, organized in a guild with rules and regulations. They were skilled in all aspects of building from structural design to facade decoration. They also absorbed techniques from elsewhere through exchanges with tradesmen that travelled all over the Muslim world. 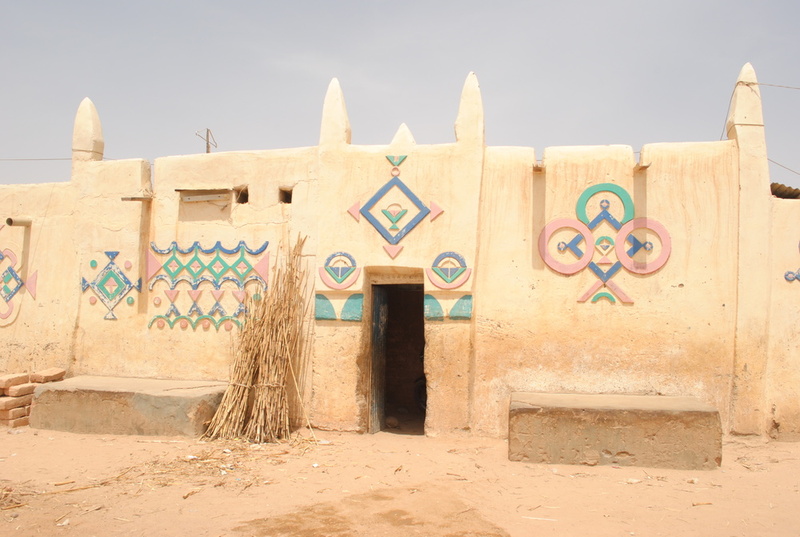 Hausa architecture consists of one to two story structures made of adobe. Privacy in Hausa architecture is paramount. Homes are built inside a tall compound wall that provides privacy and security to its inhabitants. Aside from the entryway, openings on the street side are nonexistent or are very small in size and number. The architecture has a language of its own, and is rich in terms of structural innovation and expression (especially inside), and its expressive facades. The latter can be very intricate, highlighting the entrance and the wall surrounding it. These decorations were specially commissioned by the head of the household to convey a message. The design was ultimately left to the craftsmen to produce, but the owner was motivated by the desire to express a social, religious, economic or even political message to their community. For instance, the more well-off a person was, the grander the entryway to their home would be. Similarly, the street-facing walls of the compound would be molded and decorated for those who had the means to commission such work. The more intricate the decoration, the richer the household or the more layered the message. Facade decoration was therefore a device used predominantly by the elite of Hausa society. Traditionally, facade decorations were achieved by molding thick clay onto the adobe walls’ clay finish. The designs were intricate and took a lot of time and skill to achieve. Their execution was undertaken by highly trained builders who sought toshowcase their knowledge and skill through their design. It was a truly artistic undertaking. Colonization and Post-colonization building projects introduced cement to the built environment, which created new motivations for plastering one’s traditional home. When used as external coating, the cement provided water proofing for the adobe walls during the rainy season. This new plastering and decoration approach could be done much more quickly than what was done traditionally and gave rise to specialists in the area. Plastering became a separate task in the building process, which didn’t necessarily intervene at the inception of the building, but could be applied later on. The mai shafe or “plasterer” became a new figure in the building environment and offered his services independently of construction timelines. One consequence of the new facade building technique using cement, is that they provided wider access to these decorations to lower class people. It was ultimately cheaper as it saved money down the line in yearly repairs from water damage, and allowed the common man with certain means to make improvements to his home, express a level of status and gain satisfaction through living in a more attractive dwelling. Unfortunately, cement also happens to be incompatible with adobe, causing the plaster to peel off the wall overtime, and patching the facades up is not as easy as it is with clay. Since the 1970’s, decorated traditional Hausa houses in cities like Zinder (in Niger) or Zaria, Kaduna, Kano (in Nigeria) are becoming a thing of the past. As is the case everywhere else in Africa, cement-block homes with garages and air-conditioning are considered the new status symbol. It is interesting to note however, that in a quest to re-affirm that sense of status, decorated walls are making a comeback in cities like Niamey, Niger’s capital. It would be interesting to see how far such a re-appropriation goes and if it manages to revive (and perhaps even re-invent) this traditional building expression in the long run.